After listening to his story, I am forced to presume U. Subramaniam was never the typical Government servant. He may have retired from the State Department of Cooperatives in 1992, but from three decades before that and two after, his heart always remained elsewhere. His face may have remained hidden behind shelves and files but his mind floated in a world of words. And he never gave up the pursuit of his literary or journalistic calling. “It was that inner voice constantly pushing me to make up my mind and start writing,” he asserts. Well, you may think there is no dearth of writers these days. So what is so special about lean and petite Subramaniam? Not only has he authored 130 short stories and over 200 essays and articles in English but he has voluntarily undertaken an additional job of distributing his books free of cost. During the last two decades post- retirement, Subramaniam has derived immense joy and honour in traversing the city by bus notwithstanding the crushing summer days or rain filled roads and giving away copies of his compilation of short stories to schools and public libraries. He doesn’t bother about the physical strain and the holes the exercise leaves in his pocket. “I have a supporting wife and son, who are also my best critics,” he smiles. “Majority of the city schools will have at least two of my anthologies in their libraries,” shares the author of six volumes of short stories with a tint of pride. “So many factors can easily deflate the drive, self-esteem and spirit of aspiring writers of any age. I have had my share too. But once a written piece is published, it sustains the writer’s spirit running in the vein,” he says. His brush with the pen began when he was posted in Ooty. “I got my first piece ever on tribals of Nilgiris published in an English daily in 1967. Ever since there has been no stopping, despite rejection from several publishers.” His ‘Middles’ on edit pages, short essays on contemporary issues, simple stories about life, book reviews have been in circulation in various publications. As a little boy, temple festivals and caparisoned elephants fascinated him. “Now I like to observe people. I started reading fairly young to learn new things and writing a lot in the school’s literary magazine,” recalls the Kerala born and bred boy. 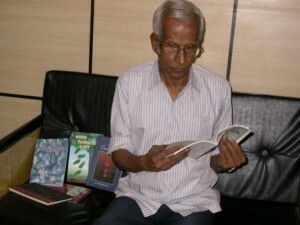 Even as he read different genre of authors in his growing years, he had his favourites from Ernest Hemingway and Somerset Maugham to Alice Munro, Toni Morrison, Irish Murdoch and R.K.Narayan, from John Updike and Nadine Gordimer to Shashi Deshpande and Kamala Das, Vivekananda, Sarat Chandra and Tagore to Arundhati Roy, Vikram Seth and Anita Desai. His personal collection exceeds 3,000 titles. While his articles appeared in a wide range of publications including The Mail, The Mirror, The Tort, Nilgiri Herald, Kochin Window, The Afternoon, Alive, Caravan, he feels the turning point came when M.J,Akbar changed the face of journalism as Editor of the erstwhile weekly magazine “Sunday” inviting commissioned writers. To convey his personal perception of the world, Subramaniam employs lot of capturing examples and draws parallels from daily life. His six compilations of two dozen short stories each are an interesting combination of light-hearted, nostalgic, enjoyable, and even not-so- terribly important matters. Just two years before his retirement, he was transferred to Madurai in 1990 and ever since made the city his home. As short story writing remained his pre-occupation, he came out with his second compilation in 1999 titled “In the Afternoon of Life.” Thereafter, followed “The Committed Official”, “When Pandavas Lost”, “The Enemy of Life” and the last one in 2008 “As Dusk Falls”. True, Subramaniam’s works are mostly spontaneous creations which come out of his inner being. Just the way he says, “I stick to life”, pure Indianness mediated through the English language makes the charm of his works. And because he wants the young people to “know, experience and feel the different emotions and expressions of life” that he goes about distributing free copies of his books after printing them at his own cost. Editor’s Note. U. Subramaniam’s new collection, Selected Stories, was published in Feb 2016.